Autumn is well under way but these diehards are hoping for an Indian Summer. 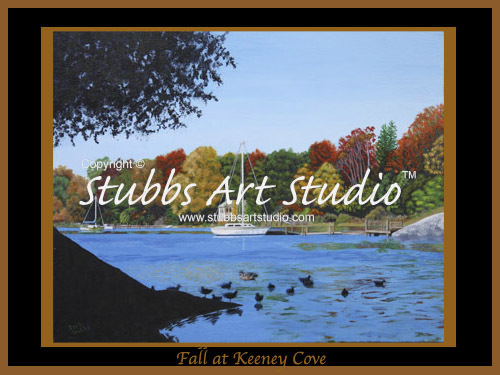 This colorful acrylic on canvas painting by Barb Stubbs should look familiar to the residents of Waterford, East Lyme, and Niantic, CT. Tucked away off Niantic River Road in the town of Oswegatchie, this view of Keeney Cove can only be seen looking down river from the children's park. The calm waters and morning sun make this a very peaceful place, even with the ducks quacking and fluttering about.